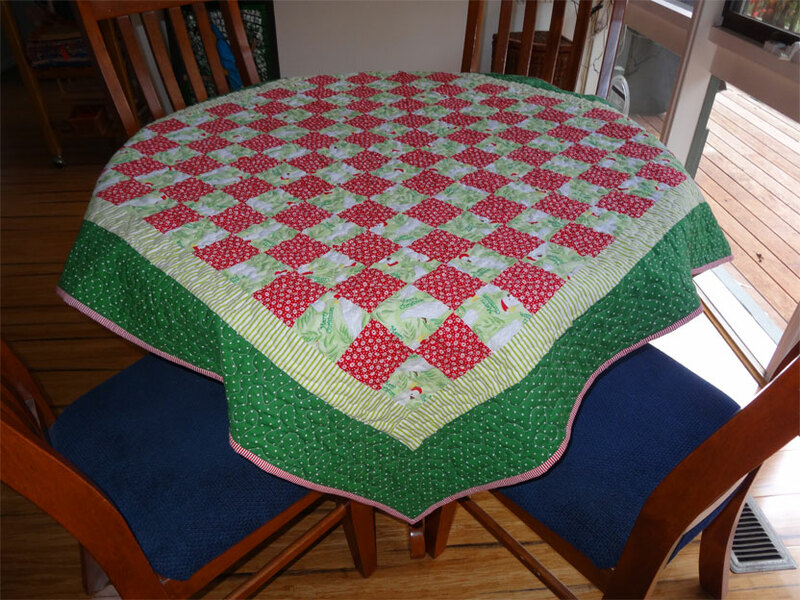 I started quilting in early 2010 and blogging almost at the same time. I have tried to post at least once a week (on Wednesdays), although sometimes not quite meeting the goal. There was even a year when I posted nothing! When I started out, I'd do a post about my latest design, then do a post about the fabric I bought for it, then maybe a couple of posts sharing about the construction of the quilt and so on, finishing a post showing the completed project (with the "DONE!" in the title). Blogspot allows me to set up posts so that they are automatically published on the day/time of my choosing. The week before Christmas, I was setting up a post for Quilt 133 - and realized that, at my one-per-week pace, that post wouldn't be published for 8 weeks! WHOA! I don't see my quilting slowing down any time soon. 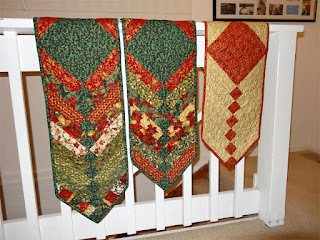 In fact, I've got quite a few quick-and-easy projects in the queue, so the pace is likely to pick up. I'm also seriously considering offering longarm services to other quilters, which means even MORE quilting happening. ...publish 2 posts per week, one on Wednesday and one on Sunday. That way the blog stands a better chance of keeping up with what I'm working on. 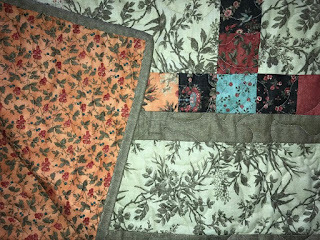 ...make more quilts for little boys and more that are gender neutral (I seem to always be doing flowers, birds and butterflies). Quilt 126: Green Batiks - DONE! 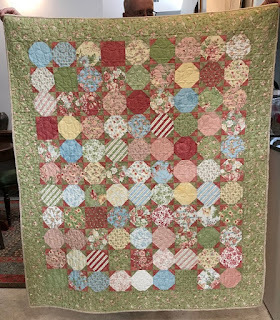 Of all the quilts I've done this year, one of my favorites was Quilt 119 - a kit from Patchwork With Gail B. 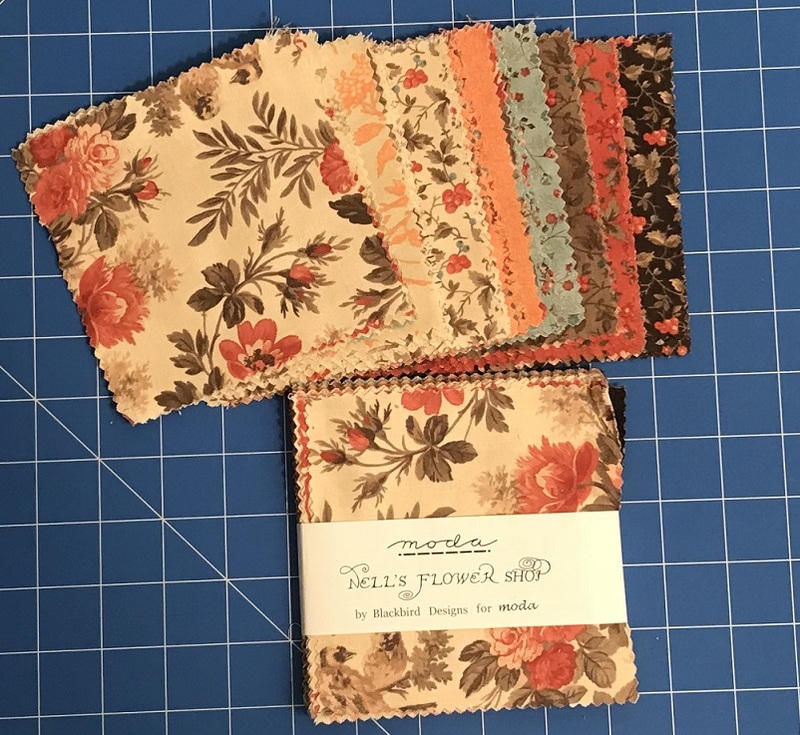 The kit is called "Nells Flower Shop", and I had a ball putting it together. I found some charm squares online that I thought would make up beautifully with that pattern.These squares are from Robert Kaufman - and are all gorgeous green batik prints. 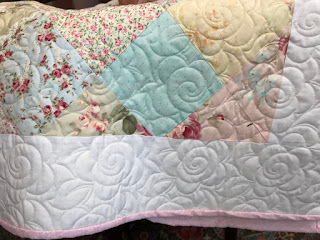 I just love how it turned out - going to make some more of these! We're having a quiet Christmas Day here in Melbourne, with a grand lunch (slow-roasted lamb, buttermilk biscuits and other goodies) and generally enjoying the holiday. 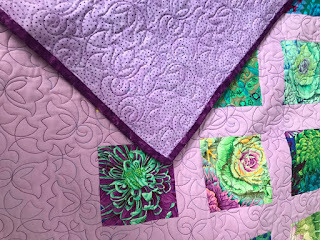 Started 2013, completed 2018 - 92" x 112", quilted on the longarm ("Simply Stippling" groovy boards. And that's all I've done! Yup! I need to lift my game. I do have quite a bit of Christmas prints in my stash of fabric. I'll make a point of doing a few holiday projecgts in 2019. In the meantime... MERRY CHRISTMAS! 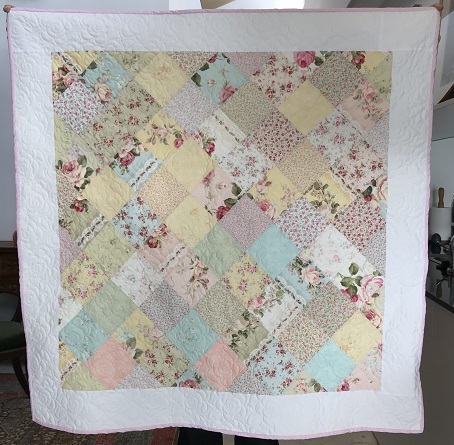 Quilt 125: Lecien Floral Collection baby quilt - DONE! 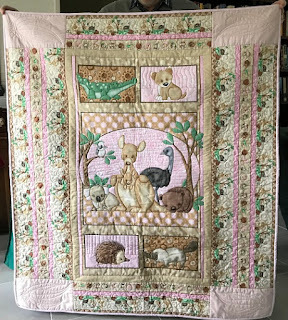 A while back I did an on-point baby quilt "Nana Mae". Time to do another one! This time I'm using Lecien's Floral Collection Pastel charm squares. 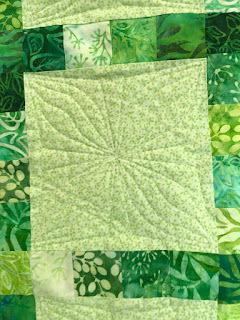 And here's a closeup of the quilt showing how the pattern looks on the quilt. The backing and binding are done in a soft pastel pink print. 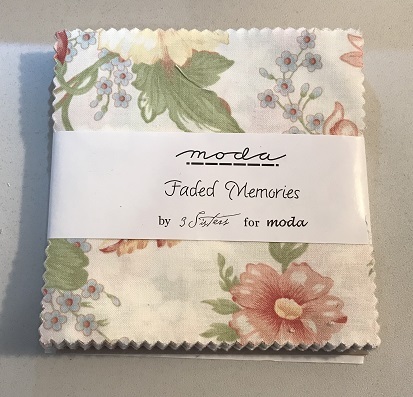 Quilt 124: "Faded Memories" (encore) - DONE! 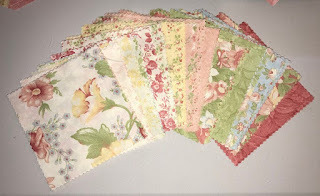 Way back in 2010 I bought a quilt kit for Patchwork With Gail B (one of my favorite shops). It was my 3rd quilt, and turned out fabulous. 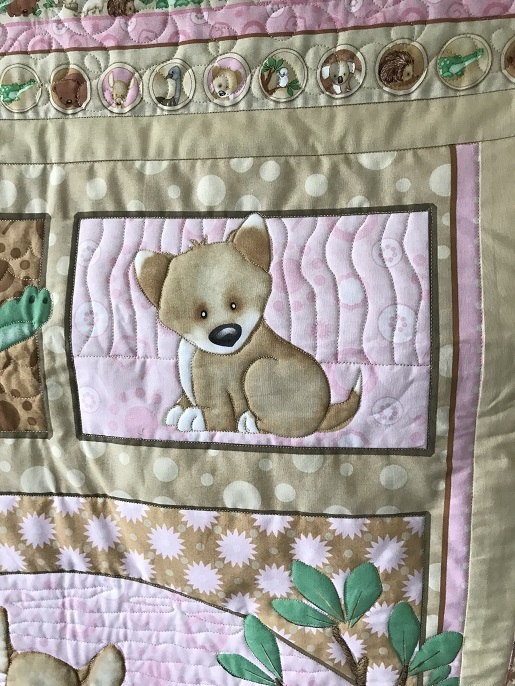 (Click here to see my original post about that quilt). Back last August, the shop had a big sale, and they even had those kits marked down! I couldn't resist - figured it would be a good one to send on to Inspirational Quilts (a great charity). And here's the prints that come in this pack. 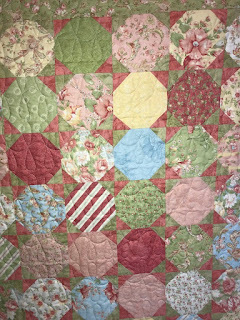 Thee quilt consists of simple "snowball" blocks with a border. 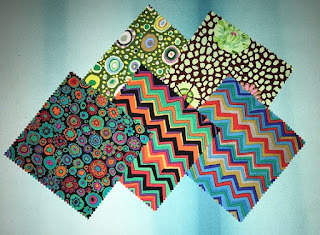 Here's a closeup of the blocks. The "snowball" corners alternate dusty rose and grey green. Very simple but also very effective. 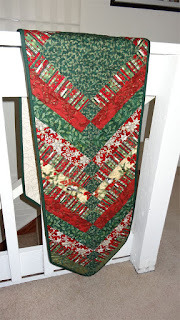 I quilted it on the longarm using a simple "eternity" loop design. 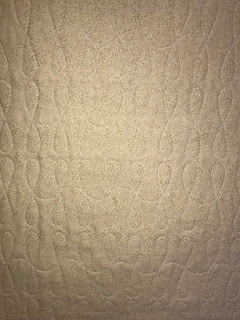 Here's the backing, where it's easier to see the quilt pattern. 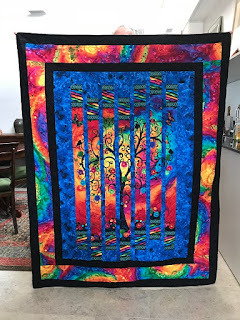 I loved doing this quilt again. Even though there are over 500 pieces in the top, it was a fairly fast and satisfying project. And the fact that it was "fast" tickles me a lot, because I remember spending hours and hours on it way back in 2010. 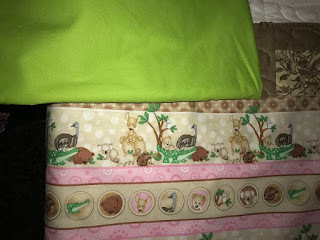 I guess I've come a long way in my 8 years of quilting - have learned a few things that reduces the amount of time it takes me to put a quilt together. 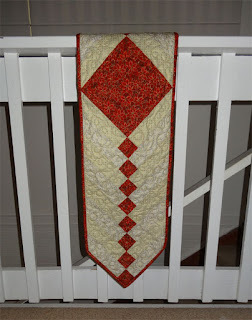 Big thanks to my quilting guru Pauline, who pointed out that I was missing a post last month! I checked and sure enough - I had posts all lined up to "auto publish" but somehow managed to miss November 14th! It's all good now. 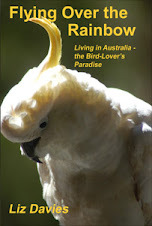 I went back and correted the problem today - just adjusted the publishing dates and all is well now. 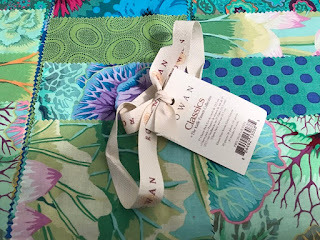 So if you're following this blog and looking today - you might want to scroll down and look at the previous week's post as well as this week's, just so you don't miss anything. Thanks for being so vigilant, Pauline! Quilt 123: Minnie Mouse 2 (baby size) - DONE! 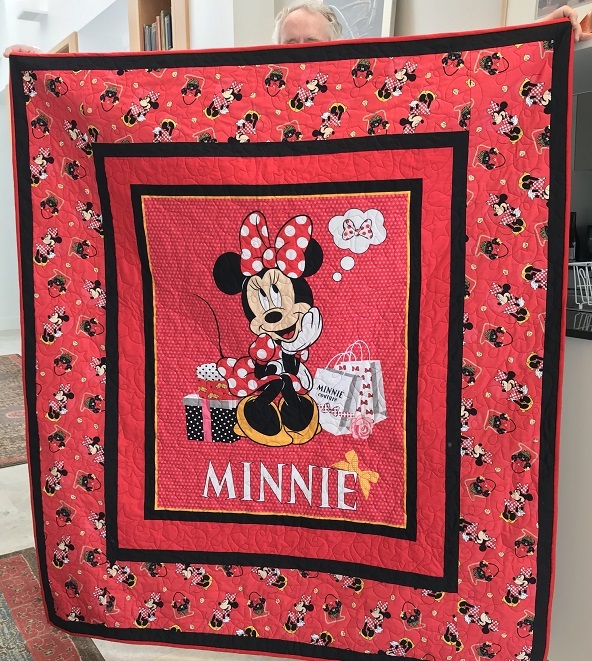 A couple of weeks ago I posted about an adult-size "Minnie Mouse" quilt I made for a friend. I had a second panel, and a little bit of the coordinating print, enough to make a baby-size quilt - and here it is! 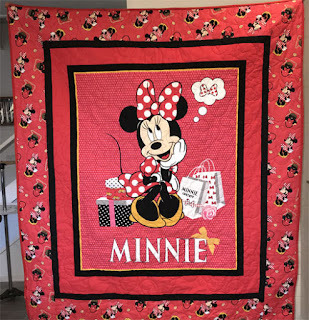 When hubby Stephen held this one up for the photo to be taken, he remarked that the print on the backing fabric looks exactly like mouse droppings. 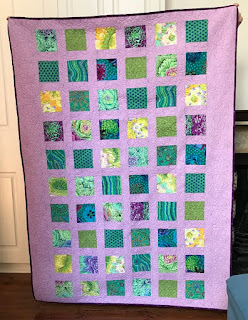 Quilt 122: Kaffe Classic Purple and Teal - DONE! I love charm squares - and found this "Kaffe Classic" set from Rowan online. 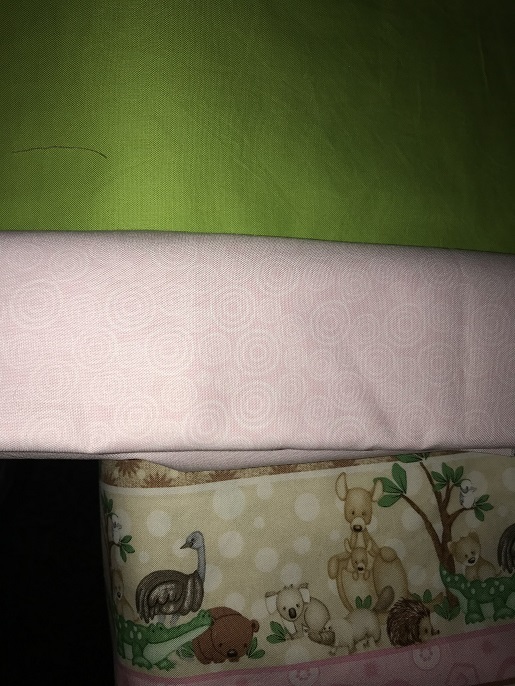 The photo on the website where I ordered the fabric showed squares of purple, blue, teal, and greens. 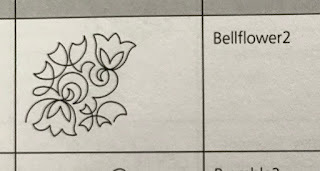 I thought: "gorgeous"! I'm afraid my camera isn't doing well with the colours here, just trust me: They didn't match the other colours at all. So I pulled them out and set them aside. 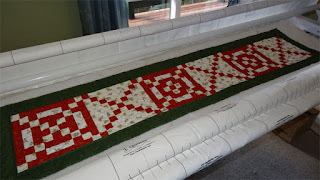 And inserted a 2/5" lattice and a healthy sized border on the left and right. And here's the finished quilt! 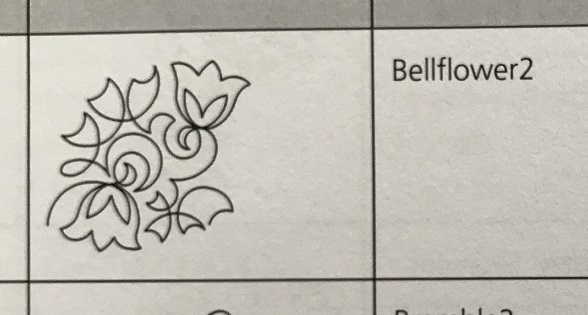 For the quiltinig, I chose the Q-Matic pattern "Bellflower2". 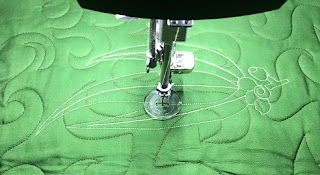 It's a fairly small, dense stitching pattern (if you don't resize it to a larger size, which I didn't). With the quilt being the size it is, and the dense stitching, the Q-Matic gave me fits. Apparently there is a definite limit to the number of total stitches it can handle. 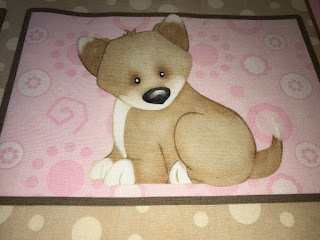 So I had a fairly dense stitching pattern, a pretty good sized quilt, and also had the audacity to select 12 stitches to the inch. I managed to get it done, but oh heavens! 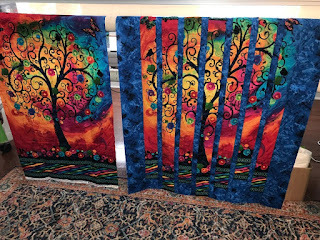 I pretty much had to stitch one end-to-end row, stop and do a complete reboot of the system, then set up the quilt again each time I had another row to complete. It drove me nuts. After wrestling with it for several hours and observing the system's behaviour, it became apparent that the "realign safe area" function is where the problem is. I don't know why the system doesn't just give you an error message. Seems to me it should, but there you are. Anyway, I managed to slug my way through. And here's the backing and a closeup of the top. Each of the squares on the top are 4.5" - so yeah, a lot of stitching on this quilt! 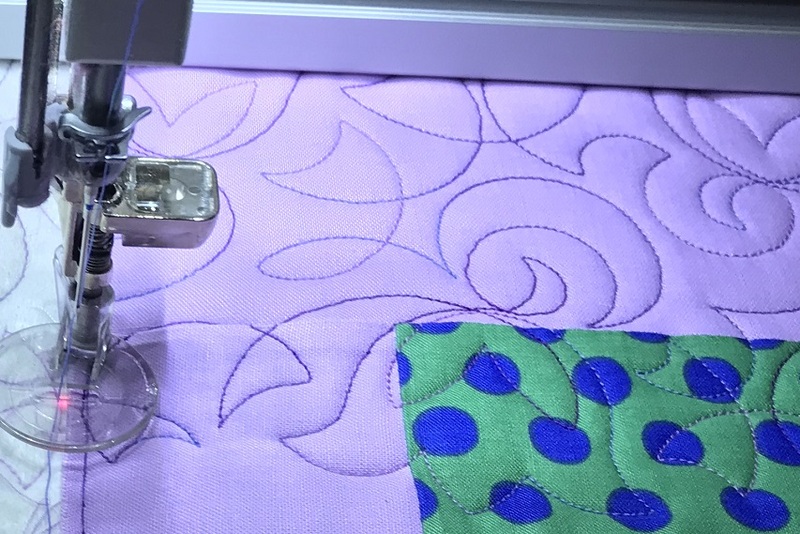 As you can see, I bound it in a very deep purple fabric - to help pull up the darker purples in the top. This project did give me some headaches, but the results are lovely (I do wish my camera captured colours better...). 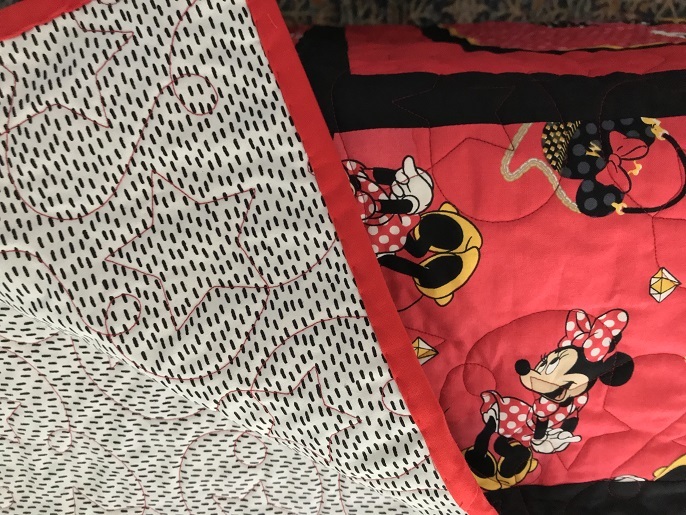 Quilt 121: Minnie Mouse 1 - DONE! The panel is in the center. I added a narrow black border, a wider border using a coordinating print, and a 3rd border (black) on the outside. 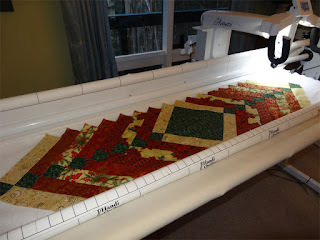 The binding is done in red. 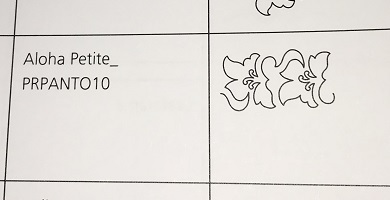 Here's the stitch pattern I selected. 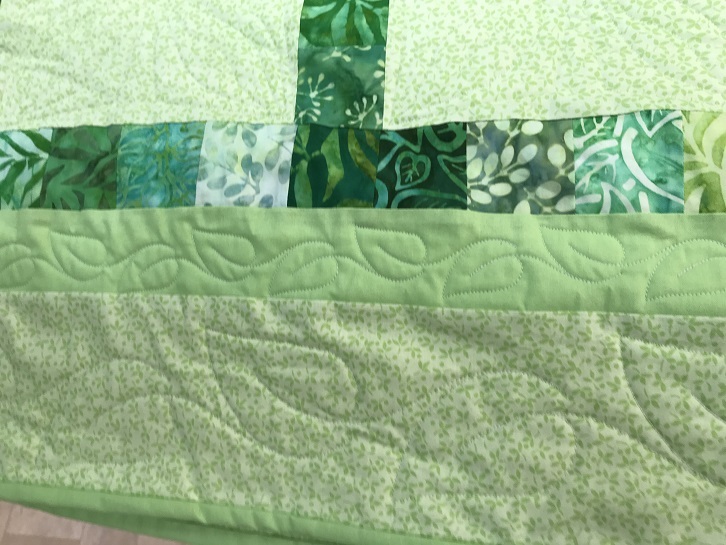 And here's a closeup of the backing, binding and you can see how the stitch pattern fits into the quilt. I used red thread, which pretty much fades into the background. This one is a fairly big quilt - but I have another Minne Mouse panel and will be doing a baby-sized one." 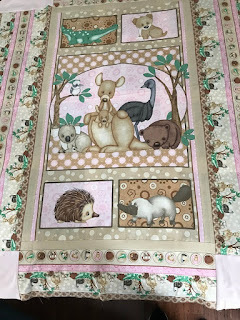 Quilt 120: Baby Australian Animals - DONE! 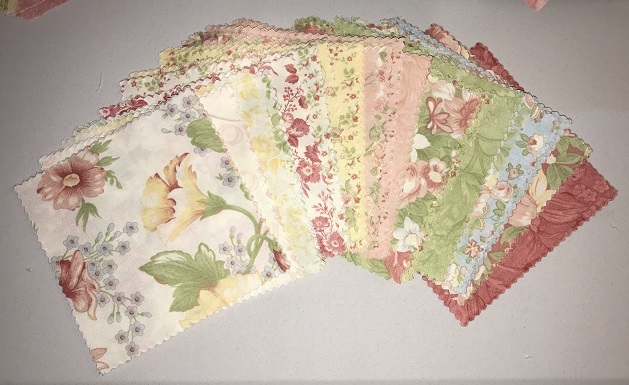 There was a sale at Patchwork With Gail B - and they had an adorable quilt kit marked down. I couldn't resist. 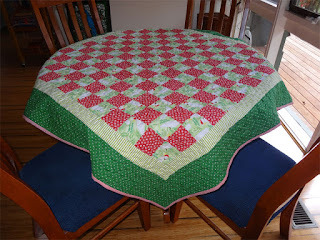 Here's the top, after piecing. There's a center planel with baby Australian animals shown, and the borders are an adorable coordinating print. 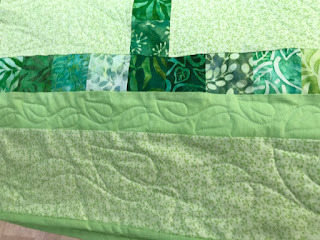 In the corners, the original design calls for some of the coordinating print to be cut out and applique'd - but I felt that was too busy. Instead I decided to insert a fancy-stitch design of my own. 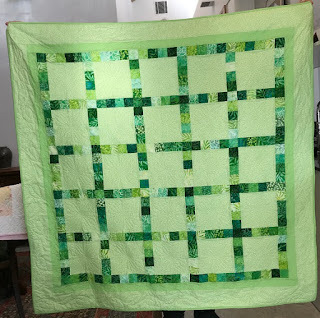 I had a length of bright green that I wanted to use for the backing. It's not an exact match to the greens on the top, however. 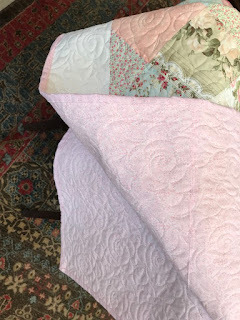 But binding the quilt with this pink swirly leftover fabric would create enough separation between the back and front- and the pink goes great with both! 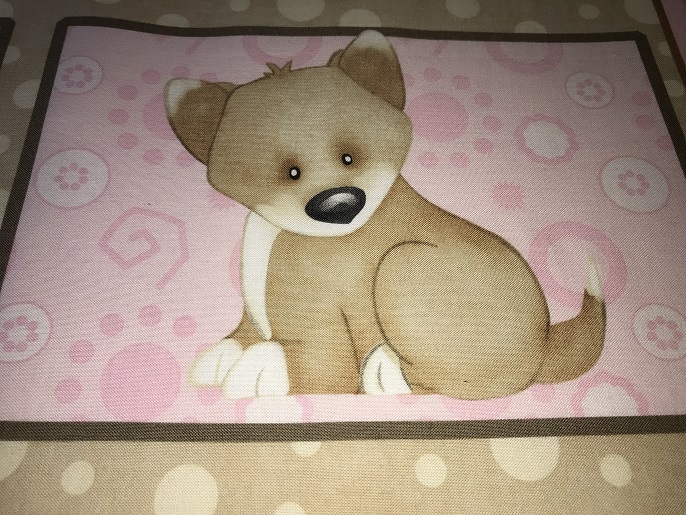 I mentioned wanting to do a fancy design in the corners with stitching (instead of applique). I found this image online - a cluster of gum leaves. 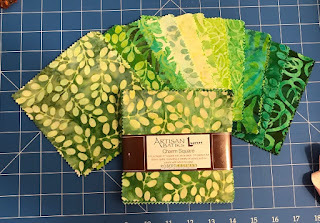 I used the Art-n-Stitch software that came with the Q-Matic to trace the leaves and make a stitching pattern I could execute on the longarm. 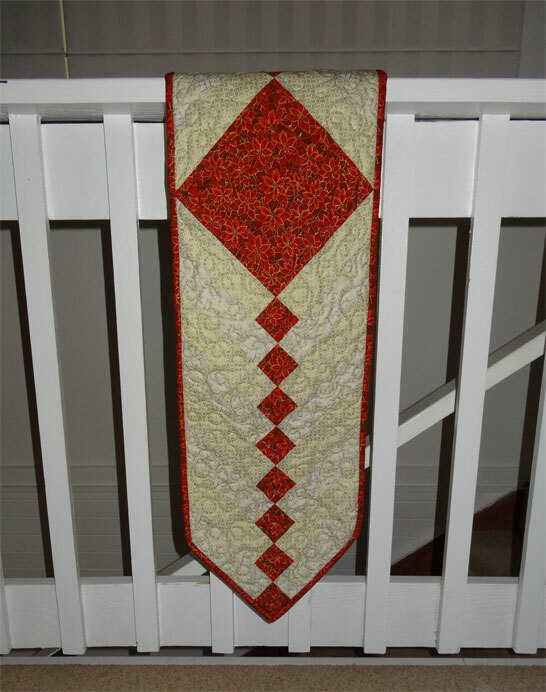 And here's my test of the design using scraps. It turned out great! 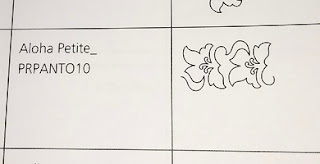 The animals in the center panel are really cute. 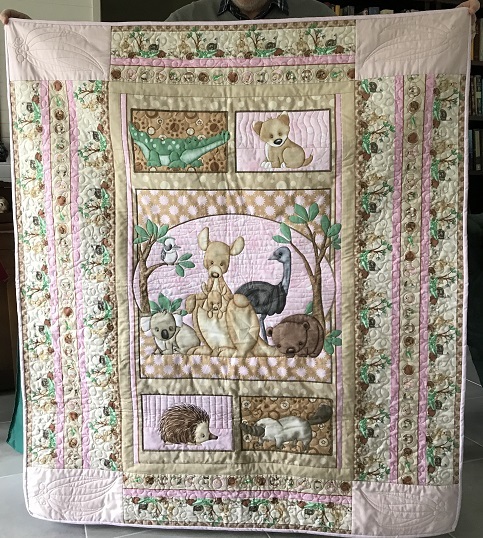 I didn't want to do end-to-end quilting on this quilt, but opted instead to outline the animals and add a little bit of interest to the backgrounds inside the frames. 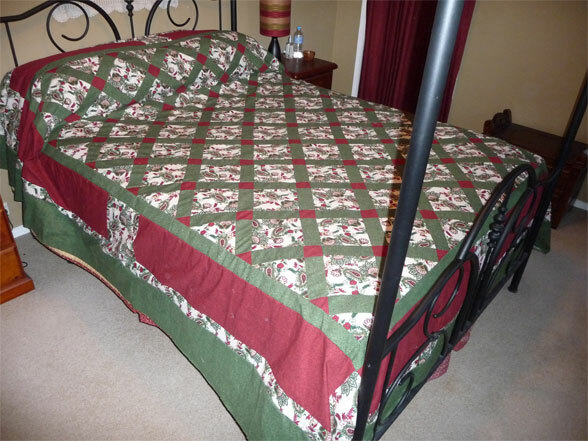 And here you see on the finished quilt how that turned out! My friend Sarah just became a grandmother for the first time recently. She saw this quilt and fell in love with it - so it's going to be her gift to her granddaughter. 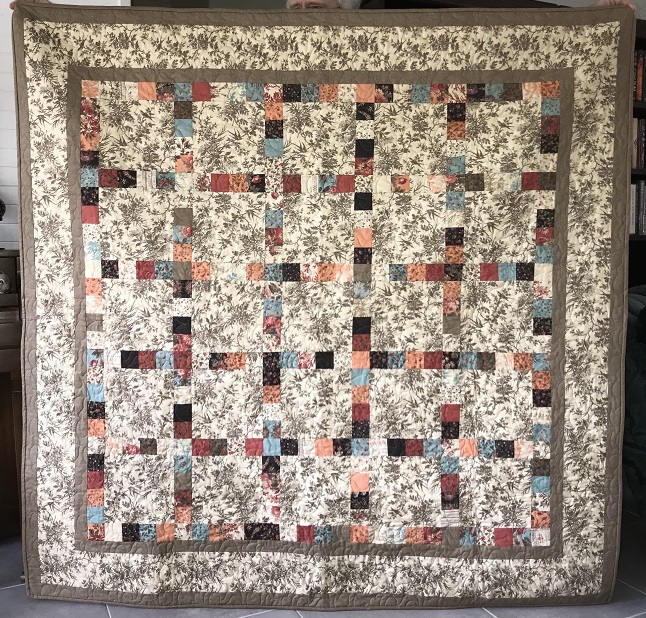 Quilt 119: Nell's Flower Shop - DONE! 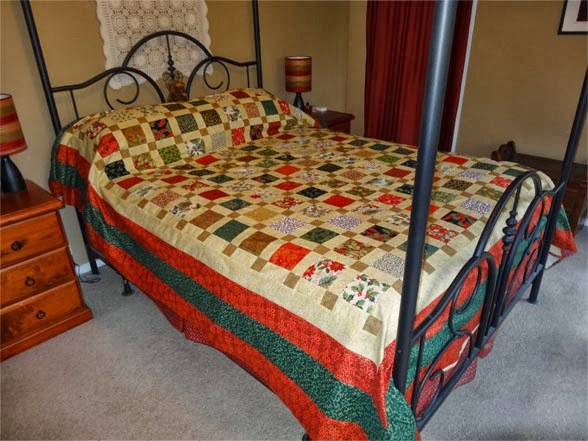 This quilt is a kit from "Patchwork with Gail B". I've been in love with this design for years and finally broke down and bought the kit. It looks so elaborate, but is actually so simple! 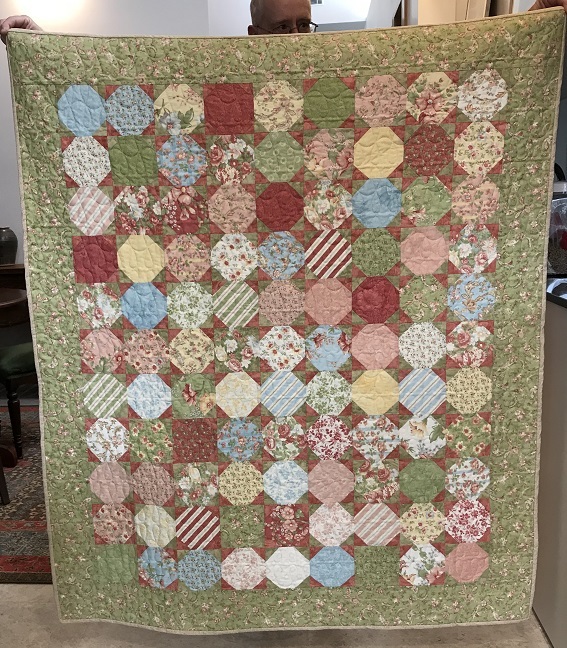 And here's the finished quilt. 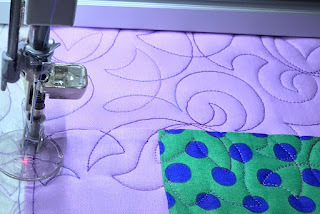 Basically, all you do is cut the charm squares into into 2/5" squares, then sew them around blocks of a coordinating (and lighter) fabric. Tack on borders, and you're there! I was so surprised at how fast this went. 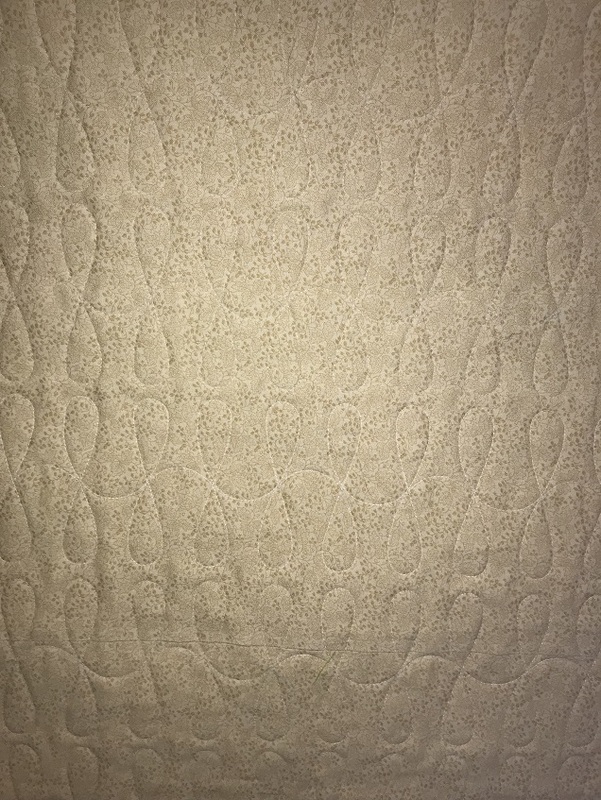 Here's the quilting pattern I selected from the library that came with the Q-Matic. I used tan thread, which beautifully disappears into the prints. For the backing, I managed to get a few meters of fabric on sale that happened to be part of the same Moda line. A bargain! 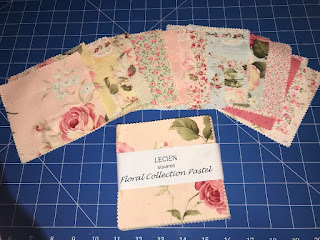 I loved making this quilt and I have quite a few charm square packs that I ordered online and will really work with this design. You're going to see a lot more of these (in different prints, of course!). Quilt 118: Tree of Life I - DONE! I found these panels online, and a friend was interested in them, too. 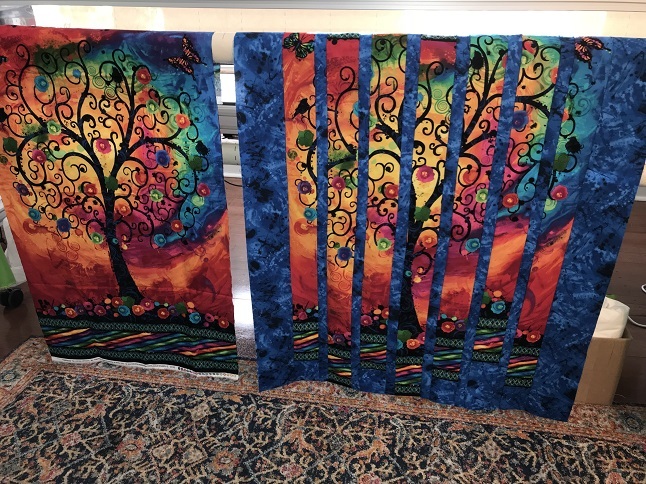 She found a photo online of a quilt made by slicing the tree panel into strips in inserting coordinating blue fabric in between the strips (somewhat as I've done to the panel on the right, below). I also found another coordinating print - the wild rainbow swirlies I used for the border (below). And for drama, I inserted a 2" black border on eather side of that. Well, you gotta admit: it's colourful! 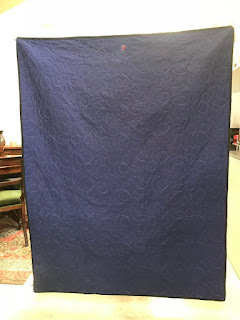 The backing is solid navy homespun, and I used a medium grey thread (which fades well into the top but is nicely visible on the back). 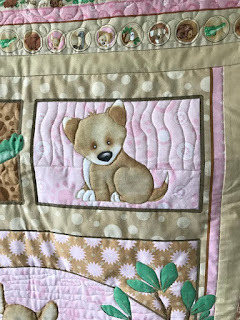 My husband especially likes this quilt. 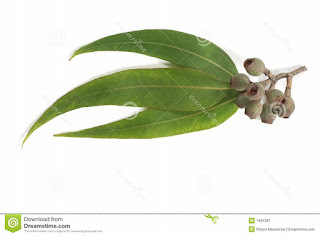 He said the tree reminds him of the drawing style of Australian cartoonist Michael Leunig. You know what? He's right! I'm going to do the other panel a little differently. 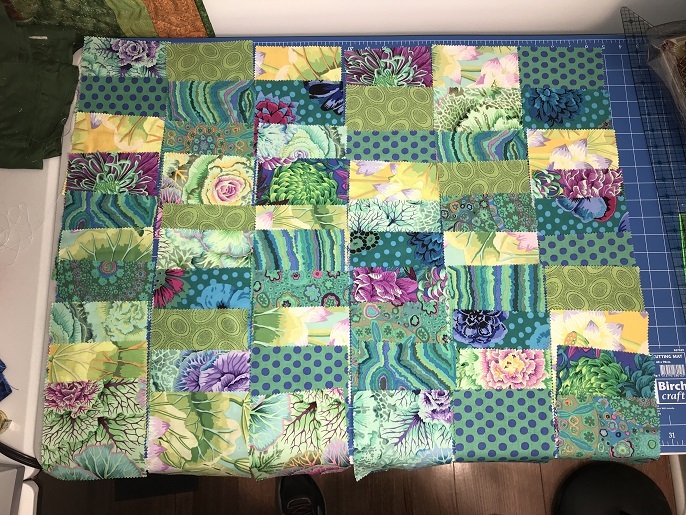 I'm going to trim down the top of the panel and will use only the bright blue coordinating print for the borders (instead of the rainbow swirlies).